Los Angeles wage increase has huge implications for the city’s workers and the nationwide Fight for 15 movement. Nearly half of Los Angeles just gave itself a raise. Following a wave of state and local minimum-wage bills and initiatives, Los Angeles became one of the largest cities to dramatically raise its hourly base pay and join Seattle to hit the magic $15-an-hour demand pushed by labor and community groups nationwide. 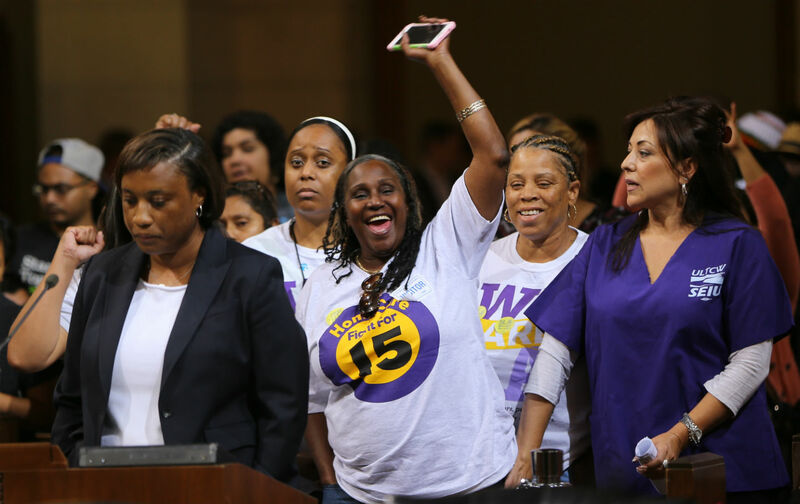 The City Council approved 14-1 this week an unprecedented minimum-wage increase, phased in over five years, covering up to 800,000 people and adding an estimated $5.9 billion in new income. Workers currently earning the minimum wage make about $19,000 annually. Hotel workers led the way last year by pushing the city to set a sector-specific $15 hourly base pay. And the protests of the past year led by fast food and other low-wage workers has focused the legislative conversation around the figure at the center of the Fight for 15 movement. Though some firms will face financial strains under the wage mandate, which is indexed to inflation, advocates anticipate the stimulus will help alleviate inequality by redistributing opportunity more fairly across the city’s polarized social landscape: the poorest households are concentrated in neighborhoods that will benefit the most from the wage increase, particularly for black and Latino workers, according to the think tank Economic Roundtable (ERT). This will also help generate more than 46,000 new jobs while pumping more than $400 million into local tax coffers. “What we have been seeing happening is a real movement demanding a wage that families can live a decent life and be able to afford the basics,” says Laphonza Butler, head of the long-term care workers union SEIU-ULTCW, part of the Raise the Wage Coalition. Now other cities face pressure to follow suit, including New York, where the hardscrabble campaigners behind the first fast food strikes are now rallying around Governor Cuomo’s initiative to raise the industry’s pay through a special wage board. Still, with sky-high housing costs, Los Angeles will remain unaffordable for a large swath of low-income families, even on a steady job at $15 an hour. But advocates hope the new wage, which is tied to paid sick leave, will provide a stronger baseline for workers to organize around, especially if they have the other half of the Fight-for-15 demand: union rights. The higher wage floor should have “a positive impact on the negotiating opportunity for all workers. And if anything else, it’s an opportunity to move the economy forward in a way that in some ways has been held back by stagnant and low wages,” says Rusty Hicks, head of the LA County AFL-CIO. But there are other questions of sustainability that LA should examine now that it has lifted the wage floor. Finally, while boosting the city’s low-wage economy is vital, real sustainability means improving its ecology too. While it moves toward a $15 minimum wage by 2020, the city is still lagging severely on the path to meet federal mandates to reduce greenhouse gas emissions by 17 percent below 2005 levels by 2020. ERT recently mapped its economic analysis onto an environmental evaluation of regional industries, showing that low wages and relatively high emissions go together in many of the city’s worst jobs. For example, restaurant and bar workers earn less than $18,000 a year, but the sector pumps out 15.56 metric tons of greenhouse gas emissions, compared with information-based jobs that pay about quintuple that in wages, but produce just half a metric ton of harmful emissions. Since Angelenos will lose out in the long run if higher incomes only drive more destructive production and consumption patterns, researchers urge city policymakers to develop “industries that have a light environmental footprint and pay sustaining wages to their workers.” ERT President Dan Flaming says via e-mail that the wage increase may help some less-environmentally damaging service industries become more socially sustainable. Meanwhile the long-term stimulus “will also increase public revenue available for infrastructure investments,” which could boost, for example, renewable energy. “It would be beneficial for LA to link infrastructure investment to goods and services procured from local businesses,” he adds. Durable social transformation for Los Angeles demands not just higher wages for its poorest workers, but a loftier political vision, for reinvesting the public dividends in a greener future.